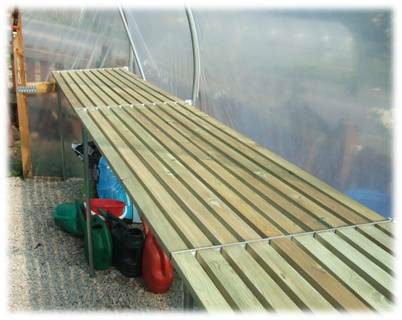 Take a look at our Polytunnel Staging, designed and manufactured by Robinson Polytunnels. Our aluminium and steel Staging Support Framework really does take "Centre Stage". 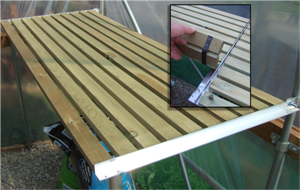 This polytunnel staging system is so simple to assemble and use and just clamps to the leg of the hoop. The Staging Support Framework has a top Tee-Bar or Angle-Bar to support your staging worktop which can be fixed in place through the pre-drilled screw holes. Our Staging Worktops fit neatly onto the Support Framework and the completed kit is fantastic! We've got to say, our polytunnel staging puts others in the shade.